The VOID, the global leader of a new category of immersive location based experiences, has teamed up with ILMxLAB to create "Star Wars™: Secrets of the Empire" – a first-of-its-kind location based multi-sensory interactive adventure in a galaxy far, far away. Using state-of-the-art VR technology, The VOID will transport guests deep into the Star Wars universe where they can walk freely untethered, see, touch and interact with the environment. Participants will feel the turbulence of the skiff below their feet, withstand the impact of blaster bolts, and smell the smoke as they approach the fiery planet Mustafar. Star Wars fans, travelers and locals alike will now have the chance to live out their fantasy at the Grand Canal Shoppes at The Venetian and The Palazzo Las Vegas beginning at 10:00 a.m. on April 27. "Star Wars: Secrets of the Empire" is a socially interactive, breathtaking journey that blends the physical with the virtual world. Under the orders of the rebellion, teams of four guests must work together to infiltrate an Imperial base disguised as stormtroopers where they'll navigate through to steal critical intelligence with help from familiar Star Wars characters along the way. "Star Wars: Secrets of the Empire" officially opens to the public on April 27 and is located at St. Mark's Square at the Grand Canal Shoppes at The Venetian and The Palazzo Las Vegas. Pre-sale tickets are available starting April 9 at thevoid.com/locations/lasvegas. Hours of operation are Sunday through Thursday from 10:00 a.m. to 11:00 p.m. and Fridays and Saturdays from 10:00 a.m. to 12:00 a.m.
Cliff Plumer, chief executive officer at The VOID said, "Las Vegas is the experience capital of the world, and we are excited to bring a brand new, fully immersive location based experience to the local market and out of town visitors. The power of The VOID will allow guests to step into Star Wars: Secrets of the Empire and not only see this spectacular world, but also hear, feel, touch and even smell as they realize they are a part of this incredible story." Melinda Holland, senior vice president of business development of GGP Inc. said, "We are excited to host our second location of Star Wars: Secrets of the Empire in collaboration with The VOID and ILMxLAB at the Grand Canal Shoppes at The Venetian and The Palazzo Las Vegas. Following the success we've seen from our Glendale Galleria location, we are delighted to provide this incredible VR experience which allows our shoppers to step into the Star Wars universe. We expect this to be a must-see stop for visitors and locals alike." Vicki Dobbs Beck, Executive in Charge at ILMxLAB said, "Storytelling has always been the centerpiece of the Lucasfilm companies. While creativity leads, technology enables and our collaboration with The VOID is no exception. With Star Wars: Secrets of the Empire we are telling a new kind of story in a galaxy far, far away and we're excited that people in Las Vegas can now share in this immersive adventure." Step inside your favorite story with The VOID; the global leader of a new category of immersive location based experiences that utilize cutting edge tech and IP from Hollywood's biggest players to mark a new frontier in interactive entertainment and storytelling. Combining state-of-the art VR technology, physical stages and multi-sensory effects – including touch and smell – The VOID invites fans to become active participants in a new hyper-reality. The VOID's Experience Centers are located in: Anaheim (Downtown Disney), Glendale, CA, Lindon, UT, Orlando, FL (Disney Springs), London, UK, Dubai, UAE, and Toronto, ON. For more information and to purchase tickets, visit thevoid.com and follow @voidvr on Instagram, Facebook and Twitter. Founded in 2015, ILMxLAB is Lucasfilm's Immersive Entertainment division which combines compelling storytelling, technological innovation and world-class production to create truly impactful, immersive entertainment experiences. The group develops experiences for virtual reality, augmented/mixed reality, real-time cinema, theme park entertainment and narrative-based experiences for future platforms. 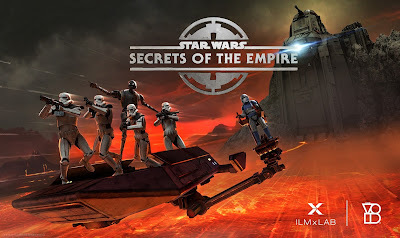 ILMxLAB is known for Carne y Arena, the Oscar-winning VR installation directed by Alejandro G. Iñárritu, and the critically-acclaimed hyper reality experience Star Wars: Secrets of the Empire. For more information, follow @ILMxLAB on Facebook, Twitter, Instagram and YouTube. Located inside The Venetian and The Palazzo Las Vegas, the center boasts 160 specialty brands and world-class restaurants nestled around a charming and faithful reproduction of Venice's Grand Canal, complete with cobbled walkways, street side cafes and live entertainment. Signature brands including Nevada's only Barneys New York, Burberry, Fendi, Jimmy Choo, Michael Kors, Louis Vuitton, and Tory Burch create an unparalleled retail environment that includes a star-studded line-up of restaurants headed by famous celebrity chefs: Wolfgang Puck's CUT, Emeril Lagasse's Delmonico Steakhouse, Buddy Valastro's Buddy V's and Carlo's Bakery and Lorena Garcia's CHICA, as well as SUSHISAMBA, Mercato della Pescheria, SUGARCANE raw bar grill and Once, the newest restaurant from famed Los Angeles chef, Ricardo Zarate. The center is also home to entertainment superstars, TAO Asian Bistro & Nightclub, and Lavo Italian Restaurant and Nightclub. For more information, visit www.thegrandcanalshoppes.com.